Last month the 17-year-old boy was convicted of falsely imprisoning then Tánaiste Joan Burton and her advisor. 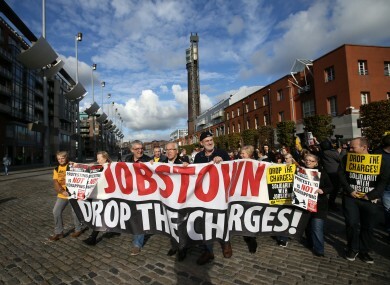 A DUBLIN YOUTH found guilty of the false imprisonment of Joan Burton during the Jobstown protest has commenced proceedings to have the verdict overturned. The 17-year-old boy denied falsely imprisoning the former Tánaiste and her advisor Karen O’Connell in two garda cars for three hours during the demonstration at the Fortunestown Road in Jobstown in Tallaght, on 15 November 2014. He was found guilty last month following his trial at the Dublin Children’s Court but was spared a custodial sentence. On 21 October, Judge John King imposed a conditional discharge providing the youth does not re-offend in the next nine months. The boy came back to the Children’s Court on Wednesday. His solicitor David Thompson told Judge Timothy Lucey that he was lodging a “notice of application to state a case” and he handed the necessary paperwork into court. This means the defence will bring an appeal to the High Court and contend that the teenager was erroneously convicted on a point of law. The boy was granted €100 bail and spoke briefly to confirm his signature before leaving with his mother and his solicitor. The teen’s conviction will be stayed pending the outcome of his High Court bid to clear his name. The Dublin west TD and former Minister for Social Protection had been at a graduation ceremony at An Cosan adult education centre and nearby St Thomas’s Church when a water protest took place outside. She and her advisor told the court earlier that they were too frightened to get out of garda cars surrounded by people shouting abuse, throwing missiles and banging on windows. One protester shouted they hoped Burton would die, the trial was told. At one stage Burton was struck with a water balloon and O’Connell was also hit on her back by a protester, the court heard. During the trial the boy’s legal team had asked Judge John King to dismiss the charges. The defence argued that it was a right to protest case and that the prosecution was “unprecedented” and a “recipe for totalitarianism”. The defence also submitted there was evidence of an agreement with gardaí that protesters would march ahead of a garda car carrying the two women. However, on 21 October, following the four days of hearing evidence and legal arguments, the boy, who cannot be named because he is a minor, was found guilty by Judge King who held it was “indisputable” that the former Labour leader and her advisor were detained against their will and could only leave at the protesters’ whim. He also said the boy was present throughout and was an “active participant” in blockades around the garda cars carrying Burton and her advisor. Neither Joan Burton or O’Connell wanted to provide victim impact statements. Detective Garda Paul Smith agreed that Joan Burton has said she, “did not have any desire for any young person to go to jail in respect of the charges before the court”. The trial judge was furnished with a booklet of testimonials about the boy who has no prior criminal convictions. He had also noted the teenager recently had medical problems which remain undiagnosed and they may have been related to the stress he was under. Judge King complemented the teenager on his realisation of the necessity for social justice. He took into consideration the youth’s previous good record as well as work he has done in his community and for charities – including helping the homeless, for which he has received awards. The juvenile court also heard that the youth did well in his Leaving Cert and has been offered a job in a firm which will pay for him to go to college. The judge also noted evidence of gardaí including one who compared the scene to a “rugby maul”. He said Karen O’Connell said gardaí had to encircle them in a “cocoon” and the movement was like a scrum and she began hyperventilating. The former Labour leader had also said she did not think it safe enough to get out of the garda cars and she felt extreme hostility and she was apprehensive about “Where would they run to?” if the car doors were opened by the crowd. He noted that Karen O’Connell said she was frightened and that she was not in a position to leave and feel safe. Prosecution barrister argued Tony McGillicuddy that the prosecution case was that the former Tánaiste and her advisor were detained by the actions of the teenage defendant in conjunction with the actions of others. The defence cited the right to protest and freedom of expression under the Constitution and the European Convention on Human Rights. However, Judge King held that these protections were not unqualified rights and were subject to conditions and penalties as necessary for public safety and disorder, crime prevention and protection of the rights of others. Comments are closed as legal proceedings have begun. Email “Convicted Jobstown teen to take appeal to High Court”. Feedback on “Convicted Jobstown teen to take appeal to High Court”.